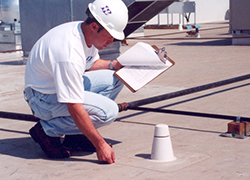 When was the last time the roof covering your commercial building was inspected? If you don’t know the answer to this question, then your roof and everything underneath it could be at risk. What may seem like a simple leak could wind up costing you thousands of dollars in repair costs. Water has a unique way of finding its way into everything. It also has the ability to cause damage to almost everything that it comes into contact with. A simple roof leak is not simple at all. It is serious, and a roof inspection could help you locate the leak before it causes any type of major problems. Every building needs to be inspected regularly. The Choice Roof Contractor Group’s trained professionals take this job very seriously… they use the tools and devices necessary to get an accurate reading on the condition of your commercial roof. Of course, climbing up on the roof to investigate with their own eyes is the first thing they do. If your roof passes our contractor’s rigorous inspection and does not need any servicing, they will give you a timetable for the next inspection and explain to you any issues you might experience in the future. If the roof has some need for repair, the inspector will go over with you in detail their recommendations and the costs. We understand your budget is always a major factor in the roofing solutions decided on as well as the amount of intrusion the repairs will have on your business. With Choice Roof Contractors as your roof inspectors, you can be assured that the only work needed will occur and that everything repaired is 100% guaranteed by them. Regardless of the type of roof you have, it is an investment that should not be taken for granted. It protects everything underneath it, and in most cases you would not even be able to operate your business without it. Something as simple as a roof inspection can add years of life to your investment, and the costs associated with the inspection are minor when compared to the costs of repair and replacement. A roof inspection schedule should be created the moment your roof is completed. In fact, this is also when the first round of inspections will take place. From this point, an inspection schedule is put together, and it must be adhered to. Why Regular Commercial Roof Inspections Are Important! Roofs are designed and constructed to last for several years, but the harsh outside world can quickly cause all sorts of problems that most people are unaware of. 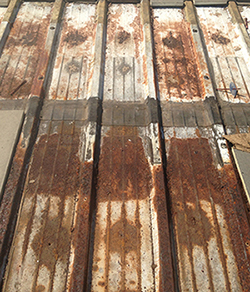 Just the normal wear and tear from the elements can be really tough on a commercial roof. Roofs have to be able to withstand constant abuse from wind, rain, heat, snow and hail. They also have to be able to continue offering protection and performance when the building shifts, contracts, or expands with the seasons. 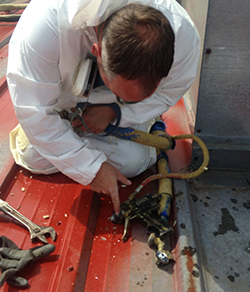 Routine inspections can help identify problems that happen as a direct result of these common occurrences. If you are not following any type of regular roof maintenance or inspection schedule, then call us today before major problems start happening.